How important is Mobile Readiness for your business? We want to look at business’ value and mobile readiness, delving into whether or not there is a correlation between the two. Does the success of a business value model correspond to how mobile ready they are? We are all in agreement that a satisfied customer represents a successful business. It is essential that we are communicating in the right way. Where applicable, how big of a role does mobile readiness play in customer satisfaction? We have brought together real-life data and hidden data, looking at the levels of mobile readiness of businesses. 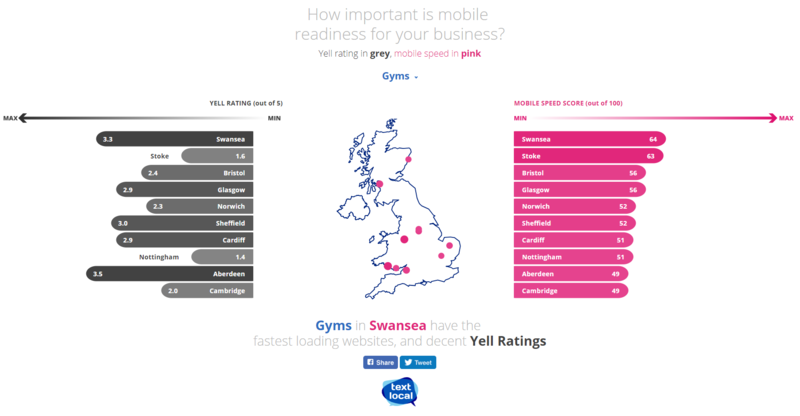 With an interactive data set, we can now compare mobile friendliness, mobile speed and yell ratings by business type across a wide range of UK locations. We can also measure the most technologically mobile-advanced location in the UK per capita. 86% of consumers use smartphones for consumer activities. Consumers also spend an average of 3.3 hours a day on their devices. It is no surprise that businesses who implement a mobile strategy see 40% more revenue on average. Comparing business success metrics, such as annual revenue numbers and reviews to mobile compliance rates, we can conclude that mobile readiness is something to consider for 2019 – improving customer satisfaction, business efficiency and a boom in revenue.